TO IMPROVE TONIGHT AS THE WIND DIRECTION SHIFTS. Spring is here and it's time for another Tweed Ride! A ride for ladies and gentlemen of leisure through Boston and Cambridge. To keep in line with the Memorial Day holiday, we will be ending the ride with a picnic most likely at Artesani Park in Brighton. Bring your own picnic baskets (utensils, dishes), dish to share and grill-ums. A few good stories about Harvard and Allston as The Crimson wraps up its coverage before summer vacation. “It’s easy for an individual to point fingers at a large institution without understanding the University’s perspective, but it may also be helpful for University planners to walk a mile in local shoes,” says one Allston employee who wished to remain anonymous to protect his relationship with his employer and neighbors. But despite their more balanced perspectives, several Allston residents employed by Harvard say they were not immune to the disappointment following the University’s decision to halt construction on the Science Complex. “They promised us the world, a utopia,” Robert Alexander says. At this point, all options are open, and Harvard has not decided what type of relationship it seeks or whether co-development should even happen, University Executive Vice President Katherine N. Lapp says. “We’re not sure what will come our way as we start to talk to outside potential partners, so we don’t want to say we’re going to do one thing and foreclose a possibility somewhere else,” Lapp says. With the promise of an additional 450,000 square feet of space, Allston would have lifted much of the pressure imposed by overcrowding at the school, which hampered its ability to expand its teaching and research facilities. “We are at capacity—I mean, you should see schedules,” says Nancy M. Kane, the school’s associate dean of educational programs. “It takes a computer doing advanced linear programming just to figure out when to schedule a class, and you’re always going to conflict with someone.” “It’s a nightmare,” Kane adds. long term,” Dean Julio Frenk says. Though plans are not finalized at this point, Frenk says school officials have identified potential space to be leased in Longwood. Could this work in Boston too? "the law in Brookline will allow police to levy a fine of $100 against party hosts and guests for the first incident and increase the fines up to $300 for subsequent violations. Landlords would also be fined and held liable unless they are actively working to evict tenants." "The sweeping provision, if it makes it into law, would toughen or expand rules that bar illegal immigrants from public health care, housing, and higher education benefits. The amendment would also clear the way for courts, the state attorney general, and even average citizens to get new tools, including an anonymous hot line, to report illegal immigrants or companies that employ them to the government." Remember when Harvard Law was heading to Allston? Among the most contentious issues then facing Harvard was how to expand beyond the confines of Cambridge. The university had been buying up property across the Charles River in the Boston neighborhood of Allston. When Mr. Summers’s predecessor, Neil L. Rudenstine, suggested that the law school move, the law faculty responded by voting against it, 37 to 1. But when Mr. Summers was installed as president in 2001, he put the Allston move back on the table. With the faculty up in arms, the longtime law school dean, Robert C. Clark, asked Ms. Kagan to head a study committee; he thought she had the potential to succeed him as dean and wanted to give her a leadership role. Ms. Kagan, who had just been granted tenure, would be wading into perhaps the most fractious issue at the university. She seemed to have an instinctive feel for how to build a case that would work with Mr. Summers. “Her approach was to give a rational basis, instead of just an emotional one, for the faculty’s reaction,” Professor Clark said. She hired a consultant, and persuaded the university to foot the bill, producing a 101-page strategic plan that considered everything from future growth to dormitory space to the intellectual benefits of remaining near the arts and sciences buildings. She made no explicit recommendation, but the study strongly suggested that Allston was far better suited to the biomedical sciences than the law school. The plan was soon dead, and Ms. Kagan gained folk hero status. With the notable exception of the beautiful expanded Mahoney's Garden Center on Western Ave, this "retail resurgence" in Fenway, Dorchester, Roxbury seems to be passing by Harvard's Allston & Brighton property. At the April ABNNF meeting we discussed the reconstruction of the Western Ave and River St bridges with Steve Miller from LivableStreets, Renata von Tscharner of the Charles River Conservancy, and others. From that meeting, and conversations with our Allston and Cambridge neighbors, the letter below was recently sent to the leaders of our State's Transportation department. Please share your comments below about how you'd like to see these bridges and the area around them improved. Larry Harmon has this well-deserved tribute to the efforts of the Presentation School Foundation in today's Globe and their need to raise $275,000 by June 10. In a brutal economy that has crippled sophisticated nonprofit groups, a cadre of volunteers from an unpretentious neighborhood find themselves a foundation grant or two shy of pulling off a redevelopment deal that represents the best of urban life. The sudden postponement of planned construction projects, most notably Harvard’s ambitious Allston Initiative, translates into lost jobs, broken promises, and diminished opportunities for community economic development. Based solely on potential earnings from the anticipated jobs that fail to materialize from the Allston delays, the report conservatively estimates that more than $860 million in expected economic activity will be lost over the next three years. Longer delays will deepen community economic losses. Harvard’s Allston Initiative promised to transform the neighborhood and create unprecedented economic, recreational, and cultural opportunities. Harvard’s decision to suspend the initiative will have negative impacts on the neighborhood and throughout the region due to the loss or postponement of expected jobs, stalled economic development, and the on-going underutilization of land Harvard the university has aggressively acquired over the last two decades. The Allston delay has also created considerable uncertainty among residents and area businesses and further soured already strained relations with the community. we estimate that a one-year delay in moving forward with the initial Phase 1A projects would result in lost direct earnings of more than $85 million and a total economic impact for the region of approximately $275 million. A two-year delay would result in lost short-term earnings estimated at more than $170 million, and a total economic impact of approximately $550 million. With a three-year delay, the figures increase to more than $270 million in lost earnings and a total regional economic impact of more than $860 million over the first three years. These impacts are driven solely by the forgone earnings of construction workers and permanent employees; they do not include the impacts of the lost procurement spending for construction materials and equipment that would have occurred in the region. Our estimates are therefore conservative in nature. Harvard’s neighbors in Allston will pay the highest price for Harvard’s thwarted ambitions, in lost community development, shuttered businesses, and a desolate landscape of under-utilized property. A 300+ seat pizzeria? Is there that much additional demand for 'za in Allston? Allston’s Sports Depot is in its final inning after 22 years. The Cambridge Street sports bar and restaurant will close to make way for a Regina Pizza. Boston Restaurant Associates, owner of the brick-oven pizza chain that started in the North End in 1926, will spend about $1.5 million to open a 300-plus-seat pizzeria in the former train depot in September. extend living space into the basement. 1958-1960 Beacon Street - Increase seating capacity of restaurant from one hundred and ninety-five patrons to two hundred and forty patrons. 232-244 Fanueil Street - Allow four family residential building to be built on same lot as existing two-family dwelling. 33-47 Quint Ave. Proposal to create parking for church uses. Avenue Bar and Grille, Comm. Ave. Request to increase occupancy from 151 persons to 190. 50 Hobart Street - Extend living space into the basement of a two-family dwelling. 33 Wiltshire Road - Remove and replace the retaining wall. residential building. Allow four family residential building to be built on same lot as existing two-family dwelling. US Senator Scott Brown will announce today the hiring of former Boston city councilor Jerry McDermott as the new state director of his Boston office. Neighborhood Potluck this Thursday - Please join us! "Cambridge and Boston are both looking at potential cycletracks on Western Avenue that would combine to stretch from Central Square to Allston Village." Glowing review in today's Globe for this new Lebanese restaurant on Harvard Ave.
Tuesday is your chance to be one of the few voters to cast a ballot in the special election to fill the State Senate seat vacated by Anthony Galluccio. Should Harvard buy this blighted neighborhood eyesore? 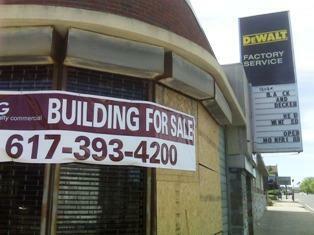 The Dewalt/Black & Decker building at the western end of Western Ave is for sale. I wrote about this property here and here, and what happens to this building will tell us a lot about the future trajectory of our neighborhood. In some parallel universe, we might want Harvard to buy it. As a first-class, long term investor in our neighborhood, we might be able to count on Harvard to develop the site for a use that would be mutually beneficial for all. But unfortunately Harvard doesn't seem to be in a position (for various reasons) to help redevelop this site. The site is located in the Western Ave / Soldiers Field Road Community Commercial sub-district where the zoning allows a maximum floor area ratio of 1 which would allow at most a 15,000 square foot building on this 15,000 parcel. Existing zoning also limits the building height to 35 feet. But considering that Harvard and Charlesview both were granted City approval to build much higher in this area and the increased, it seems unlikely that nothing bigger than a 15,000 sq ft, 35 foot building would be built here. But the neighbors in this area, and presumably any potential buyers, have no idea what type of new construction on this site might be warmly welcomed and what might be strongly opposed (either in the community or City Hall). Should this be a location for retail, housing, commercial space, or some combination thereof? If housing, should it be rental, condo, affordable, or high-end? Is a max height of 35, 55, or 75 appropriate? Asking these questions brings to mind the North Allston / North Brighton Community Wide Plan that the community and BRA were once working on together. The CWP has been in hibernation for almost a year and when key parcels, with tremendous potential, in gateway locations come on the market, wouldn't it be great if the City planners and local residents had already agreed on what type of development is desired? Instead, here we are in a realm of uncertainty, with no useful guidance existing for whoever might be interested in buying the property, and all we can do is hope that their goals and expectations match whatever might eventually come from any community/City planning that may (or may not) ever happen. Unique Commercial Building For Sale. 50,000 + Average Daily Traffic. Four (4) way intersection with six (6) designated lanes along with traffic signal at Major high traffic intersection of Soldiers Field Road, Western Ave, Waverly Street and Arsenal Street. Building is approximately 4,000 square feet with expansion capabilities. Former Black and Decker retail store, with ample parking behind and around building. Charles River Views, and abuts Harvard Redevelopment Zone. Congratulations to HDM Systems Corporation and PepperDash, who are both located on Lincoln Street were ranked 9th and 19th respectively in the 12th Annual Inner City 100 Ranking. HDM designs and manufactures advanced power electronics, which enable clean technology for battery-based mobile and renewable energy applications. PepperDash is a leading provider of control programming services, including energy management and graphic design, for educational, governmental, medical, commercial and residential environments. 72 Oakland Street - Demolish part of existing garage, change the legal occupancy from a garage to a four family dwelling, erect a four family residential building. Allow four family residential building to be built on same lot as existing two-family dwelling. "Harvard effectively has no choseive political and communication strategy for its Allston project. This isn’t just hyperbolic writing, but an observation based on the University’s repeated failures to communicate with residents and inability to identify the needs of the Allston community and find a way to work to find a mutually amenable solution." A couple times a year we get to see the amazing art of the Harvard ceramics studio. This season's sale starts Thursday and you can see some of the art here.